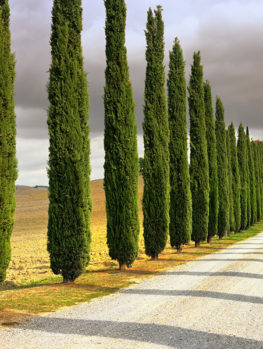 If you have been on the search for a small tree to provide a strong vertical accent in your planting, look no further. If you want a screening row of plants that will fit into a very narrow space, you are on the right page. Sky Pencil Holly is the simple answer to these common but hard to solve garden problems. Most other types of holly buses have a rounded form and they will grow wide in time. 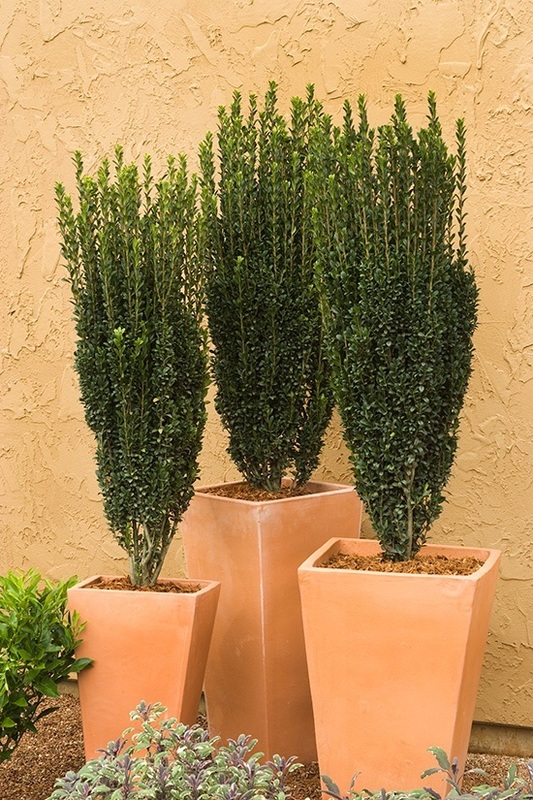 Not the unique Sky Pencil Holly, that makes a wonderful and striking vertical accent in your landscape without needing any trimming at all. It will grow eight or ten feet tall and be just two or three feet wide – a real eye-catcher and a valuable way to create a screen in the narrowest places. If you want to frame a doorway or mark special spots in the garden, this tree is the perfect accent plant. It needs no trimming to keep its neat, upright form, so just plant it, relax and enjoy. The rich dark, evergreen foliage is beautiful at all seasons. If you need a hedge or privacy screen in a very narrow spot, this is the ideal plant for that too. It will soon form a dense barrier while needing almost no room to grow – in full sun or moderate shade. It grows well in most kinds of soil and it is happy in all but the coldest and hottest parts of the country. Vertical accents are very important parts of a good garden design or layout. It is easy to put in a big collection of interesting shrubs, and then find that it doesn’t look interesting at all because the eye just wanders over it without focus. The secret is to add some strong accents, which hold your attention and make you linger. One common way of doing this is by adding upright plants and then clipping them to shape and size. But of course that is time-consuming, and who wants to be clipping, when you can be relaxing? For low-maintenance gardening, choose plants that are naturally upright and narrow in form – it’s a great time saver. For today’s smaller gardens, you want plants that won’t outgrow their welcome, and the Sky Pencil Holly certain fits that description. It is compact, but big enough to make a real statement as an accent plant. Accents can be informal, placed with rhythm through your beds, or formal, measured exactly at the corners of a square or rectangle, or in the center of a circle. It doesn’t matter if your garden is formal or informal in style, Sky Pencil Holly is the perfect accent plant in every kind of garden. With its origins in Japan, it is the perfect choice for an Asian-themed garden too. Another big issue for many gardens is the need for privacy. 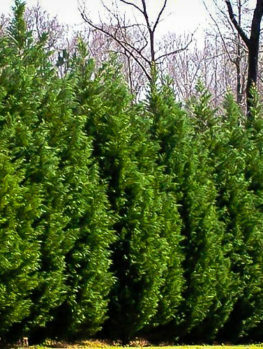 The usual solution is a row of privacy or hedging plants, like Thuja Green Giant, or Skip Laurel. However, there are lots of spaces in today’s gardens where these plants grow too tall and wide, and where you need something slim. Often down the side of a house there is a narrow space between the house and the property line – sometimes just a few feet wide. You still need to be able to walk down this space, yet there are windows looking out that face straight at your neighbors’ home. The solution is a hedge that is no more than two feet wide, but tall enough to screen those windows. Sky Pencil Holly fits that description perfectly. It never grows more than 2 to 3 feet wide, yet it will reach 10 feet tall, which is more than enough to screen your ground-floor windows. These kinds of places are often shady too, and again this lovely, slim holly will work well in a shady location. 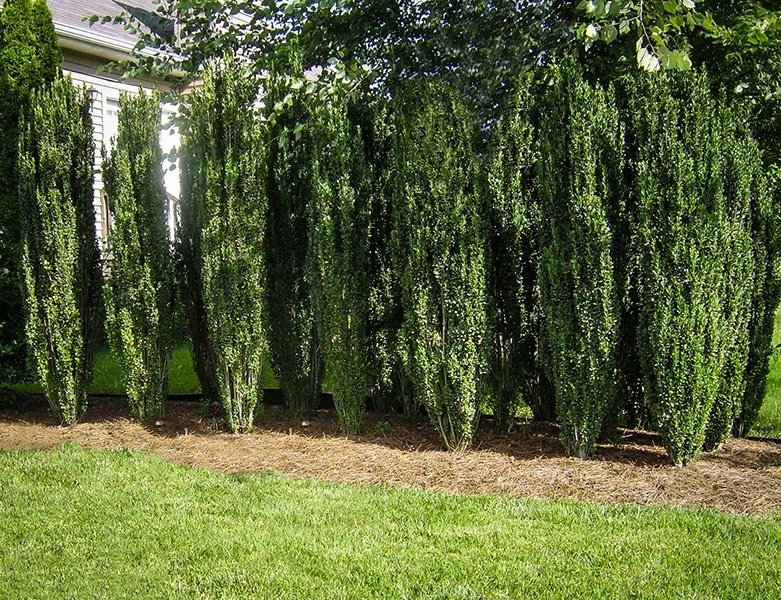 If you need a narrow hedge like this, but in very hot, dry areas, we also recommend the Italian Cypress as the perfect slender tree for harsh locations. In full sun, or moderate shade, this holly bush will be equally happy. Its tough leaves won’t burn in the sun, and this is a plant that also thrives in partial shade. Whatever the conditions, unless this is a very dark corner, you are sure of success. When checking the shade of your site, look up. Can you see the sky, without many tree branches blocking it? If you answer yes to this simple question, then even without any direct sun, holly bushes will thrive. This is because the sky reflects high quality light down onto your plants, which they love, and they will not need direct sun at all in such a location. Sky Pencil Holly is the perfect choice if you live in zones 6 to 8. That covers minimum winter temperatures down to minus 10 degrees Fahrenheit. If you have a sheltered location and live in zone 5, where temperatures can get to minus 20, then you may see some browning of the leaves in winter. However, you will soon see fresh new growth in spring and your tree should be just fine – you can still enjoy its slender beauty. At the other extreme, if you are in zone 9, then a shaded spot, with sufficient water at the roots, but not sprayed daily on the leaves, makes this plant a worthwhile choice. In between, you will never have a cold or heat related problem with this great plant. If you have ordinary garden soil of any kind, then Japanese Holly will be happy to move in to your garden. It thrives in normal garden conditions, no matter if your soil is sand, loam or clay. It does best in slightly acidic soil, but that is common throughout the east, and even slightly alkaline soil is perfectly fine for this tree. The soil should not be constantly flooded, as they do need some drainage for the best growth. Like every plant new to your garden, your newly-planted hollies will need some regular watering, but once they are established they will not need much attention. If the soil becomes very dry, then a good soaking will keep them happy for a few more weeks. Beyond the hot weeks of mid-summer, normal rain in the other months should be all they need. Here is another plus for the Sky Pencil Holly – it has no serious pests or diseases – especially if you keep it properly fertilized and water it from time to time. In hot areas, mulching and regular watering are important for healthy growth. There is a large range of holly plants available, and it can be confusing, so here is a simple guide. Most people know the classic ‘holly’, with spiny leaves and red berries, which is a powerful symbol of the Christmas season. This is the European holly. In American gardens, most of our hollies are hybrids of other species, from America and around the world, because the ordinary European holly does not grow so well in many states. Two popular hollies come from the Far East, the Chinese Holly and the Japanese Holly. 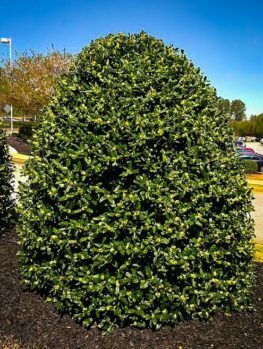 These do well in American gardens, and the Japanese Holly (Ilex crenata) is especially popular, because it does not have spiny leaves – the leaves instead have small rounded lobes on them, but they are still that great rich green color, with a handsome glossy sheen to them. The Sky Pencil Holly is a special form of the Japanese Holly. The leaves are small, in scale with the smaller size of this plant. Each leaf is a little over one inch long and about one half-inch across. Clusters of small white flowers appear in spring, adding a delicate touch to that exciting season. These trees do not normally produce berries, but if some do appear, they are blue-black in color. If you are looking for a holly bush with red berries, we strongly recommend the Foster Holly, which is guaranteed to produce a big crop of bright red berries, even if grown as a solitary specimen. Like most hollies, the Sky Pencil Holly is an evergreen, and always covered in handsome leaves. Each spring new growth of fresh foliage appears. In the beginning, the new leaves are a lighter green in color, before they mature to the typical rich, deep green that is such an attractive feature of this plant. What makes this holly so special is its narrow upright form. It will grow steadily, and always upwards. Mature plants have many upright stems crowded together, giving a dense but narrow form to this plant. When it is 8 or even 10 feet tall it will still be only 2 to 3 feet wide. This means that even in the narrowest space, you can easily fit a hedge – a hedge that does not even need clipping to maintain its narrow profile. 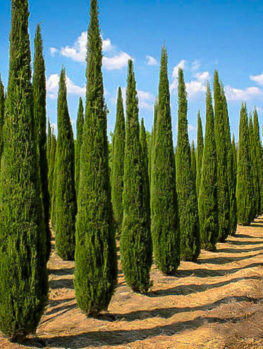 Trees and shrubs of this quality and unique form cannot be grown from seed. 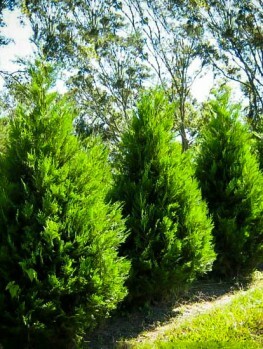 Seedling trees will be similar to the wild Japanese holly, which is a rounded bush almost as wide as it is tall. Our Sky Pencil Holly bushes are grown from pieces taken from mature plants of the original variety, skillfully rooted in controlled conditions, and grown to maturity by our specialist producers. So be very careful not to buy seedling trees, or other plants simply labeled as ‘Japanese Holly’, as these definitely will not be this very special variety, with its incredibly narrow upright form. In even the smallest garden there is room for this lovely holly plant. Use it to create a vertical accent anywhere from one foot tall to 10 feet tall, with all possible sizes in between. There is no need to trim it until it reaches the size you want, and it is easy to keep it at that size with a trim just once a year. It can be planted singly, or in groups of three or five plants, making a charming feature in any garden. No matter what the style of your garden, this plant will fit in. Since it has an interesting origin in Japan, it is particularly suitable as a feature in an Asian themed garden or courtyard, perhaps artfully planted beside a special boulder. As accents in a formal garden, planted in containers on your terrace, making a matching pair beside an entrance – these are all ideal additional uses for this plant. Most plants need special trimming to make a neat, upright hedge, but not the Sky Pencil Holly. 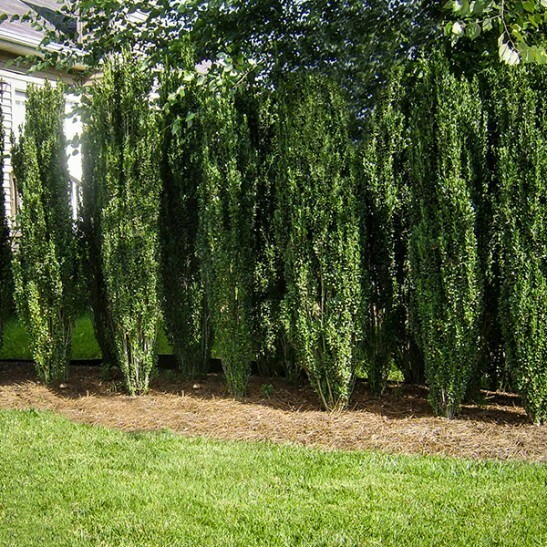 Because of its unique form, it makes the perfect, narrowest hedge possible with no trimming needed. Only mature hedges may need some light trimming to keep them perfect. Because of this, it is perhaps the easiest to care for of all the hedging plants you can grow. Trimmed, this plant will make a neat hedge of almost any height you want. You can keep it as small as 12 inches tall, like a Boxwood Hedge. 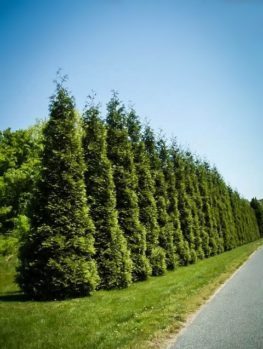 If you want a taller hedge, just let it grow steadily to the height you want, and then start trimming the top. 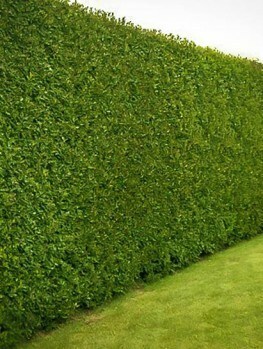 All the way to 10 feet tall, you get to choose the exact height of your hedge, with just a simple trim across the top. The sides will rarely or never need trimming until the plants are quite mature. The spacing for your plants depends partly on how tall you want your hedge to be. For a very small hedge, we recommend you place the plants no more than 12 inches apart, in a trench you have dug. For a taller hedge, you can still use 12-inch spacing, but you can also space the plants up to 3 feet apart. A spacing of 2 feet is probably ideal for all but very short hedges. If you want a wider hedge, then plant a double row, with the two rows 12 inches apart and the plants 3 feet apart in the rows. Place them in a zigzag pattern, so that each one sits in the space created in the opposite row. This is a great way to get a broader, very dense hedge, making a bold statement in your garden. Once you have chosen the spot for your specimen plant, or decided where that hedge is going to go, it is time to prepare the soil. Holly trees benefit from organic material in the soil, so add plenty of whatever kind you have. Garden compost, rotted manure, or peat moss, are all good soil additives. They help retain moisture as well as releasing valuable nutrients as they decompose in the soil. Spread a layer two or more inches deep across the soil, and then dig or till these materials into the top 8 to 12 inches of the soil. Prepare an area 2-3 feet across, and all the way along the place where you are putting your hedge. You can also add some granular starter fertilizer to the soil, to encourage good root development for your plants. For a specimen plant, dig a hole in the prepared ground about twice the width of the pot and the same depth. For a hedge, dig a trench that width along the line of your hedge. Use a tight string to get the trench perfectly straight. Water the pots well the evening before you plan to do the planting. Slide the plants out of the pot and place them upright in the hole or trench. Adjust the spacing between the plants for your hedge so that they are evenly spaced. Put the first and last plants in the row half your spacing distance from the end. So if you are using a 2-foot spacing, place the first plant one foot from where you want your hedge to begin. Once you have all your plants set out, put back about two-thirds of the soil around the roots, firming it down as you go. Then flood the hole or trench with water, wait for it to drain away, and put back the rest of the soil. You can create a low ridge around the plants to keep future water running down into the root-zone. Water your new arrivals thoroughly once a week, or twice a week for the first few weeks if the weather is hot and dry. If you want a low-maintenance garden, this is certainly a very suitable plant. It really needs almost no care to thrive and grow well. It will become a beautiful upright accent specimen, or a tall, narrow hedge, all by itself, with very little input from you. However there are a few basic things that take very little time, but that will make a huge difference to your plants. Although established plants are resistant to ordinary dry conditions, they need additional water during the first couple of growing seasons. Water once a week during the first season and then, in the second season, whenever you see that the soil is dry. After that, you will only need to water during extended periods of drought. Because holly does best in cool, moist soil, mulching around your plants is a great way to achieve this. Use a mulch of bark chips or shredded bark, or gravel if that is more in keeping with the style of your garden. Put mulch over the whole root-zone, but do not let it touch the trunk of your tree. Refresh the mulch every year or two, as needed, by spreading a fresh layer over the old mulch. Do not dig it into the soil; just cover it over with new material. To encourage rapid growth, apply fertilizer in early spring and again in early summer. Choose a fertilizer formulated for evergreen trees and shrubs and follow the directions on the package – you can hurt your plants by giving them too much plant food. Modern slow-release fertilizer are idea, and easy to use. The normally only have to be applied once a year, in early spring, yet they continue to release plant food steadily throughout the growing season. Little or no trimming is needed for your trees, except to control the final height. For denser growth while still young, cutting a couple of inches of the end of any very long shoots will encourage bushier growth. As your plants mature, you may need to trim the sides of your hedge once a year. This should just be a light trim, to keep the top a little narrower than the bottom, so that light penetrates to the lower branches and keeps them healthy. Trim in early spring before you see new growth. Even this small amount of trimming may not be necessary – you can judge how neat and formal you want your hedge to be. In 1985 the prestigious U.S. National Arboretum send Sylvester March, a member of their staff, and Frederick Darke, a curator from Longwood Gardens in Delaware, to Japan. Their goal was to find new and unusual varieties of plants to bring back to American gardens. They visited an important plant collector, Dr. Masato Yokoi, at his garden in Kawaguchi City, to see what interesting plants he had. He showed them a very special Japanese holly given him by a friend called Norihiro Shibamichi. This friend had been privileged to receive special permission to climb one of the most sacred mountains in Japan, Mount Daisen, closely protected by Buddhist monks. There he had seen a remarkable bush growing wild and been allowed to bring some pieces down for Dr. Yokoi. When Sylvester March brought the plant back to America and showed it to his colleagues, they immediately saw how special and interesting it truly was. Later, in 1992, as part of the National Arboretum’s Elite Plant Program, they released it to nurseries so that everyone across the country could enjoy this outstanding plant. Our growers reproduce this plant true to the original form of this superb holly, and we are constantly renewing our stocks so that our customers only receive the very best. As you can imagine, the demand for this plant far outstrips the ability of our nurseries to produce it, so supplies of this tree may be very limited. If you want to enjoy this special plant in your own garden, and take advantage of its unique characteristics, order now, or you may be disappointed.